One of the interesting parts of working in the golf world is dealing with weather. It is important to understand weather variations over time when planning future projects and evaluating the success of past projects. The last two summers have been hot and stormy, so I was curious: How "normal" is this weather? When was the last summer with high heat and lots of rain? The chart below summarizes July weather in Chicagoland since 1990. There are lots of ways to measure heat and precipitation, but I looked at the National Weather Service's departure from average figures for July. Out of curiousity, I also added in the number of days with rains over .5" -- big rains, in other words. The pattern confirms what I have heard from other Superintendents in the area. Besides 2010, the last July we saw this extreme combination of high heat and heavy rain was . . . 1995. Many people remember 1995 for its 100 degree days, but July also saw a lot of storms in this area. 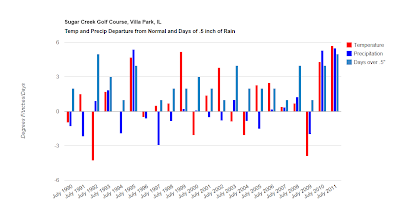 We have had other unpleasant months over the years, but 1995, 2010, and 2011 really stick out for their combination of hot and wet -- one of the toughest situations for golf courses. Notes on the chart: Clicking on the chart will open a larger version. Most of the data came from the National Weather Service. I made a couple adjustments based on local measurements. For instance, O'Hare measured over 11 inches July 2011 but we luckily missed a few of those inches. It is important to note that this chart is only meant to summarize weather in July, not the entire summer. There are many other factors in turfgrass health and golf playability, but July weather is very significant in our area. I will take a look at August and its effects later this year. 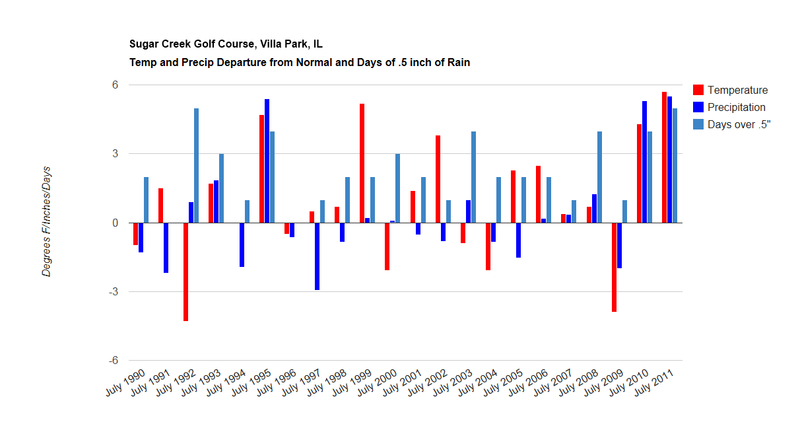 The past couple weeks have not been kind to most Chicago-area golf courses. First we had extreme heat and then lots of rain. While some turf wilted in the heat and the rough went dormant in many areas, we could cope with dry and hot. The wet period that started on July 22nd was a different matter. The end of last week (July 27-29) saw significant rain 3 days in a row with warm temperatures. This created a situation we know well in a wet late summer -- a toxic soup of wet wilt, scald, and pythium. The high temps this weekend cooked saturated, low-lying fairway areas but the rough is looking fabulous! Quite a few golfers have commented on how green it is on the course and they are right: The greens, higher areas, and rough are healthy and growing fast. It is those lower areas that are the problem. Scalded low area near the creek on #1. At the moment, there is only one thing we can do to improve the situation and speed up turf recovery -- Vent! Not the verbal kind of venting, although that can help, but the mechanical kind. Venting refers to solid tine aeration done mostly for the purpose of improving gas exchange in the soil. We have been using a machine called the Planet Air on the fairways that shatters soil while leaving only a slit in the turf and a minimum of mess. Tees are being treated with solid tines on a conventional aerifier. So far, I have no plans to needle tine the greens as they are still performing well. I've noticed a lot of superintendents are doing the same thing and dealing with a lot of the same problems. Check here for more recent superintendent blog posts (Link). I especially like this blog post as they seem to be in a similar situation (Link). In his Scouting Report for July 29, 2011, Dr. Settle writes: "Then there's why overly wet rootzones are our worst enemy. Midsummer is never a good time for cool-season turfgrass because any additional downward spiral of turfgrass health can be difficult to reverse until cooler weather returns. Root biomass/length are at their lowest levels and what's left root-wise has impaired function because of high soil temperature. Turf plants in physiological decline display abnormal photosynthesis and respiration, yet concentrated wear continues on a daily basis (the life of a golf green). Often the only recourse is a well-timed cultural method such as needle-tine aeration. If it sounds as if I'm exaggerating or blaming the weather too much, guess again." Thanks for telling it how it is! Wet + Hot + Stress = Unhappy Turf. These scouting reports a great resource for everyone involved in golf. You can check them out at Chicago District Golf Association Turfgrass. Classic water damage in a drainage swail. Saturated conditions lasted for longer than the turf could tolerate.